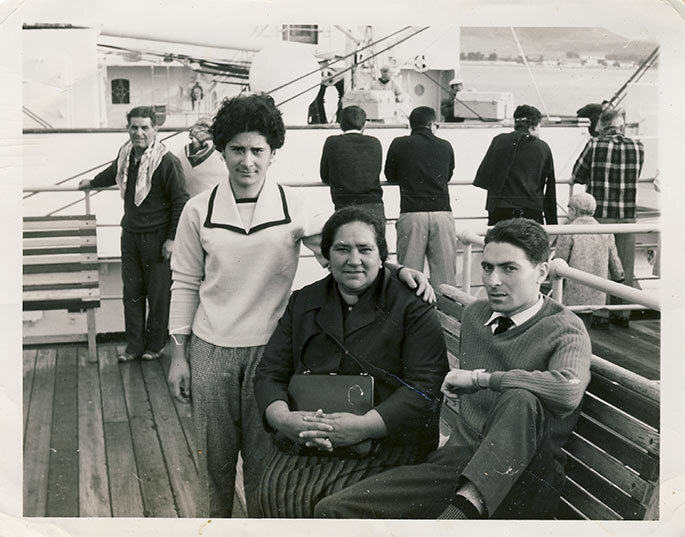 Black and white photograph of a woman and two young men aboard the passenger ship Saturnia. The woman is seated on a bench wearing a dark blazer and striped shirt. She holds her purse in her lap. She is seated next to a young man wearing a shirt, tie, v-neck sweater and dress pants. He has one leg propped up on the bench. Another young boy wearing checkered pants and a white sweater with a boat-neck collar stands next to the woman with his arm draped over her shoulder. According to records two of the individuals are identified as Clara Plateo and Rosario Mollo. A group of people stand in the background looking over the railing. They appear to be facing another ship. One person standing at the railing has turned around and is looking at the camera. Land is visible in the far right background, however it is unclear where the photograph was taken. According to the archives at Pier 21 in Halifax, Nova Scotia the Saturnia stopped at the following ports: New York, Boston, Halifax-Ponta Delgada, Lisbon, Casablanca, Gibraltar, Palma De Mallorca, Barcelona, Cannes, Genoa, Palermo, Naples, Patras, Venice and Trieste. The passenger ship arrived at Pier 21 on October 14, 1961.